The derivative is the slope of the constant pressure legs of the Brayton cycle on a - plane. For a given ideal gas (specific ) the slope is positive and increases as . We can also plot the Brayton cycle in an - plane. 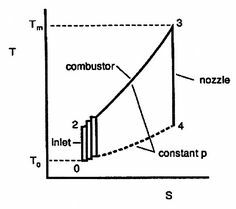 This has advantages because changes in enthalpy directly show the work of the compressor and turbine and the heat added and rejected. The slope of the constant pressure legs in the - plane is . Note that the similarity in the shapes of the cycles in - and - planes is true for ideal gases only. As we will see when we examine two-phase cycles, the shapes look quite different in these two planes when the medium is not an ideal gas. From the isentropic relations for an ideal gas, we know that pressure ratio, , and temperature ratio, , are related by: . A benefit of this view of efficiency is that it allows us a way to comment on the efficiency of any thermodynamic cycle. Consider the cycle shown in Figure 6.5, which operates between some maximum and minimum temperatures. We can break it up into small Carnot cycles and evaluate the efficiency of each. It can be seen that the efficiency of any of the small cycles drawn will be less than the efficiency of a Carnot cycle between and . This graphical argument shows that the efficiency of any other thermodynamic cycle operating between these maximum and minimum temperatures has an efficiency less than that of a Carnot cycle. 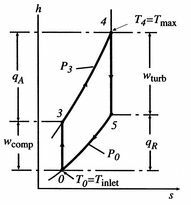 The turbine work is greater than the work needed to drive the compressor, as is evident on the ( - ) diagram.